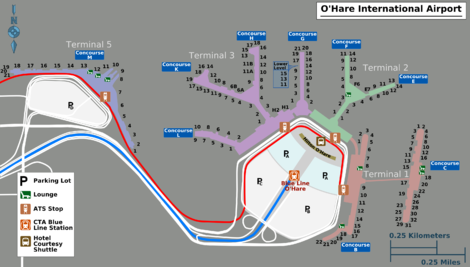 O'Hare International Airport  (IATA: ORD, ICAO: KORD) is one of the biggest and busiest airports in the world. It serves the city of Chicago and the rest of the Chicagoland area, with connecting flights to smaller cities throughout the Midwest. This is no Changi, no Kansai; in other words, it's nobody's favorite airport. O'Hare is huge, but it's from an era before airports had much in the way of amenities, and it's been stretched beyond capacity for a while now. Although safety has never been a concern, O'Hare has one of the worst on-time records of any major airport. However, many of the world's airlines fly though O'Hare, so international travelers and those making transfers aren't likely to have much of a choice. 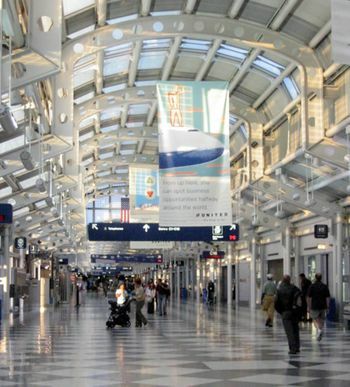 Those travelling to the area can use Chicago's Midway or Milwaukee's General Mitchell International (connected to the Loop via the Amtrak Hiawatha  train service). Alternatively, travelers may consider the Airport Express  operated by Coach USA/Wisconsin Coach Lines, connecting General Mitchell International, the Milwaukee Intermodal Station and points in-between. Chicago's Far Northwest Side is the closest part of the city to O'Hare. While it does have some charms, the most popular attractions for tourists are much further on, in the Loop, Near North, and Near South. 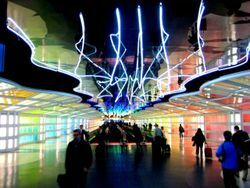 The CTA Blue Line  terminates at the space-age station for O'Hare, designed by the firm of architect Helmut Jahn. Trains run 24 hours a day, as frequently as every six minutes during peak periods and as infrequently as every half-hour overnight. The trip to the Loop should take about 48 minutes, but never cut things close with the CTA. The station is located beneath the Bus/Shuttle Center, closest to Terminal 2 but easily accessible by underground passages, with moving walkways, from Terminals 1 and 3. Those arriving at or departing from Terminal 5 (international) must take the automated Airport Transit System between Terminals 2 and 5. Metra  North Central Service trains stop at the "O'Hare transfer" station, located adjacent to parking lot F (with shuttle bus service connecting to the ATS). The train reaches Chicago's Union Station in approximately 30 minutes, but service is infrequent, operates only on weekdays and is concentrated in the peak commute direction. Pace  routes 250 (Dempster Street for Evanston and Skokie) and 330 (Mannheim/La Grange) stop at the terminus of the Airport Transit System in parking lot E.
Most taxis offer a fixed rate for the O'Hare trip from the Near North or the Loop. The price will vary from other locations, but shouldn't exceed $30 from the city center or anywhere on the North or West Side; parts of the South Side may be more expensive. If you are traveling to the suburbs, it's cheaper to take a O'hare Taxi Services  to the suburbs. Of the many shuttle/limo services, Airport Express  vans are the most commonly seen doing the rounds of downtown hotel pick-ups. Fares are $27/19/14 (per person) for one/two/three or more, with a discount for a return ticket if bought in advance and lower fares for children under 14. A portion of remote lot F is now the cell phone lot where you can park for free and wait in your car for an arriving passenger to call your cell phone, at which point you can pick up your friend curbside without circling endlessly. Shuttle buses run from lot F to E.
The upper levels of the main garage (lot A) and the adjacent surface lots (lots B and C) charge $31/day. International Lot D charges $51/day. Remote economy lot E charges $17/day, remote lot F charges $9/day. A shuttle takes you between lots F, G, and the ATS terminus in lot E.
And if money is no object, valet parking is available at $10/$17 for one/two hours and $46 for the day. Visitors are advised to notify the above parking hotline if they plan to park for longer than thirty days. Passengers may walk between Terminals 1, 2, and 3 both land-side (prior to clearing security) and air-side. The distance can be considerable; make sure to allow adequate time for layovers between different terminals. United Airlines also runs an air-side shuttle bus between its gates in Terminal 2 and Terminal 1, and American Airlines operates an air-side shuttle bus between Terminal 3 and Terminal 5 for international travelers. Scenic beauty it ain't, but O'Hare does have a cinematic legacy. For example, in the first two "Home Alone" movies, the McAllister family departed for Paris and Miami in American Airlines' Terminal 3. If you feel like playing with a TalkBoy, chasing a man in a Burberry coat, or running on to the jetway of your flight moments before you leave, here's the place. There are three family/companion restrooms in Terminal 2, and one in Terminal 3. Kids Play interactive exhibits are located in Terminal 2 ("Kids on the Fly") and Terminal 5 ("Play It Safe"), operated by the Chicago Children's Museum from Navy Pier. They're open during airport hours. If you just can't wait, there are HeartSave defibrillators (+1 773 462-7283) in all four terminals, intended to be within a minute's reach from any point in the airport. The U.S.O. has a center in front of security for active, reserve, and retired military personnel in Terminal 2, above the Delta Ticket Counter, on the Mezzanine level (Open 24 hours) For more information call +1 773-686-7396. Navy recruits reporting to Recruit Training Command go here. There are, of course, duty free shops in Terminals 1, 2, 3, and 5. Field Museum Store, 8AM-8PM daily, takes the gift shop from the great museum to Terminal 1. Hudson's Booksellers, 7AM-9:30PM daily, has a reasonable selection of books in Terminals 1, 2, and 3. There isn't much good to say about food at O'Hare. You'll pay more than you should for meals you won't remember anything about. Nevertheless, there are plenty of places to eat. A full list can be found on the O'Hare website . McDonald's, 5AM-11PM daily, has restaurants in all four terminals and is notable mainly for being open later than anyone else. Gold Coast Dogs, 6AM-8PM daily, serves airport versions of Chicago-style hot dogs and italian beef sandwiches in Terminals 3 and 5. Nuts on Clark , 6AM-10PM daily in Terminals 1, 2, and 3, has tasty popcorn & nuts for a takeaway salty fix. Sky Bridge, 5AM-9PM daily, is run by Greeks and serves gyros, kebabs, and some other Greek fare along with the basic burger and dog. A step up for the usual fast food joint, most meats here aren't cooked until you order. Terminal 2, near F9. Tortas Frontera, , 5:30AM–9PM daily, is owned by celebrity chef Rick Bayless, and specializes in hand-crafted Mexican tortas, fresh-made guacamole, agua frescas, and hand-shaken margaritas. Locations in Terminals 1, 3, and 5. Wow Bao, , 10AM-10PM daily, Fast casual Chinese restaurant specializing in bao, buns, potstickers, and dumplings. Terminal 5 near M10. Billy Goat Tavern & Grill, 6AM-9:30PM daily, serves beer, steaks, and cheeseburgers in Terminal 1. For the sake of any locals who might be around, travelers should take it as a given that everyone has already heard their John Belushi impression, thanks. Chili's, 5:30AM-9PM daily, serves a limited version of their burgers-and-pasta menu in Terminals 1, 2, and 3. Johnny Rockets, airport version of the retro-diner/soda fountain hamburger chain in Terminal 2. Mixed reviews compared to a real standalone JR, but it's a change of pace from a fast-food burger. Pizzeria UNO, 5:15AM-9:30PM daily, slums it in Terminals 2, 3, and 5, pushing watery versions of Chicago's hallmark deep dish pizza, while Reggio's Chicago Style Pizza does the same in Terminals 1 and 3. The Berghoff, 5:15AM-10:30PM daily, in Terminal 1, is the airport outpost of a historic Loop German restaurant (since the 1890s), offering bratwurst and a small part of the main location's menu. Romano's Macaroni Grill, in Terminal 3 gate K3, has entrées priced mostly in the $10-$16 range, topping out at $28 for high-end steak meals. Food is of good quality, comparable to the standalone Macaroni Grill restaurants, though is a little more oily than standard Italian fare. Wolfgang Puck, 5AM-10PM daily, in Terminals 1 and 3 has an extremely limited menu to compensate for demand and limited preparation space. It's overpriced and not tasty enough to justify the price, but if you're on an expense account, go for it. Goose Island Brewing Company, 8AM-8PM daily, in Terminal 2. Prairie Tap, 6AM-10PM daily, in Terminal 3. Many hotels serving O'Hare are actually located in the nearby suburbs of Rosemont and Schiller Park, among others. They tend to be nice, clean, bland, and expensive. Amenities are fairly standard, with an eye toward business travelers. Virtually all hotels run shuttles to and from the airport. Some run on a schedule and do regular pick-ups, while others have to be called from the airport concierge. Shuttle stops are clearly sign-posted. Make sure the shuttle is going to your specific hotel — Marriott, for example, runs separate shuttles for each of its brands. A taxi should cost $10-15 at the most. O'Hare is well known for weather issues that cause flights to be canceled, particularly in the winter and summer months. If you get stuck at O'Hare and need a hotel room for the night there is a service, Airport Accommodations, that provides discounted rates at full service hotels in the airport area that provide free shuttle service. Call their 24/7 customer service center at ☎ +1 800 935-5995 and they will help you find a room in the airport area. They do not charge for their services. Budget friendly hotels near O'Hare. Wi-fi is available throughout O'Hare Airport from Boingo . Day passes cost $6.95, while monthly rates are $9.95 for the first three months and $21.95 thereafter. Laptop Lane, M-F 6:30AM-11PM, Sa-Su 8AM-4PM,  provides secure internet connections and office services for business travelers in Terminal 1. $5 gets you five minutes. This page was last edited on 7 April 2018, at 02:08.